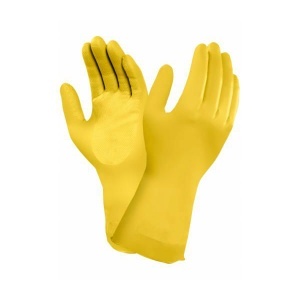 Lightweight and comfortable to wear, the Marigold Industrial G12Y Yellow Industrial Protective Gloves are ideal for providing hand protection in a wide range of food industries. They feature a natural rubber latex coating, with a beaded cuff for easier donning, and protect hands from a range of detergents and cleaning liquids. The product code for the gloves is G12Y. As the G12Y gloves offer good protection against detergents and cleaning liquids, they are ideal for tasks such as cleaning and janitorial work. They feature a beaded cuff, so they are easy to don for quick protection when it is needed most. 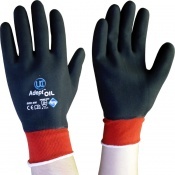 They also have good abrasion resistance to protect hands when handling coarse materials. For more information about the food compliance of the G12Y gloves, please consult the Food Declaration of Product Compliance in the PDF below. The Marigold G12Y Gloves are available in a choice of sizes, making them suitable for most users. Please consult the table below for details, then select the required size from the drop-down menu at the top of the page. 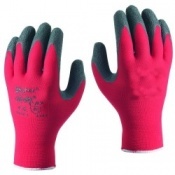 The gloves have a thickness of 0.43mm and a length of 300mm.